Interventions and their potential to target distinctly B lineage subsets and plasma cells. (A) Principles of direct (anti-CD20, anti-CD22) and indirect targeting of B cells and PCs (anti-BAFF or anti-APRIL strategies) have preferential effects on naïve versus memory B cells and PCs. (B) Principle of unspecific B cell and PC targeting, i.e., by proteasome inhibition or autologous stem cell transplantation (ASCT) with or without antithymocyte globulin (ATG) as well as mycophenolate mofetil (MMF) or cyclophosphamide. There appears to be a distinct susceptibility of memory B cell and PC dependent on the pharmacologic mechanisms. 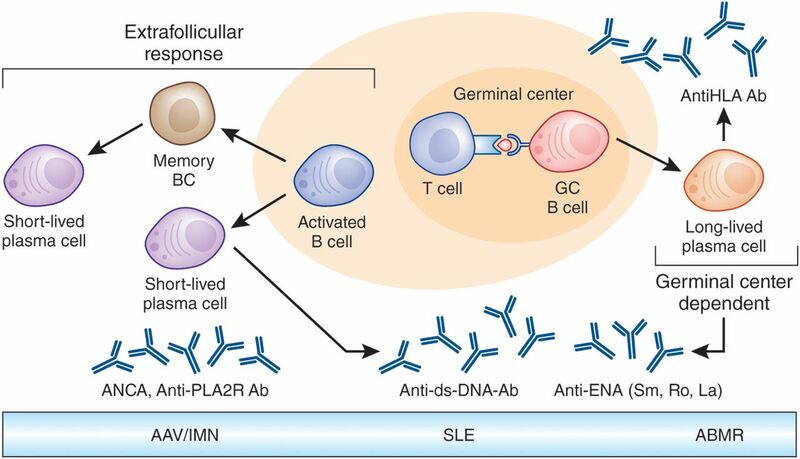 Immune intervention at key nodes of immune interaction in SLE. 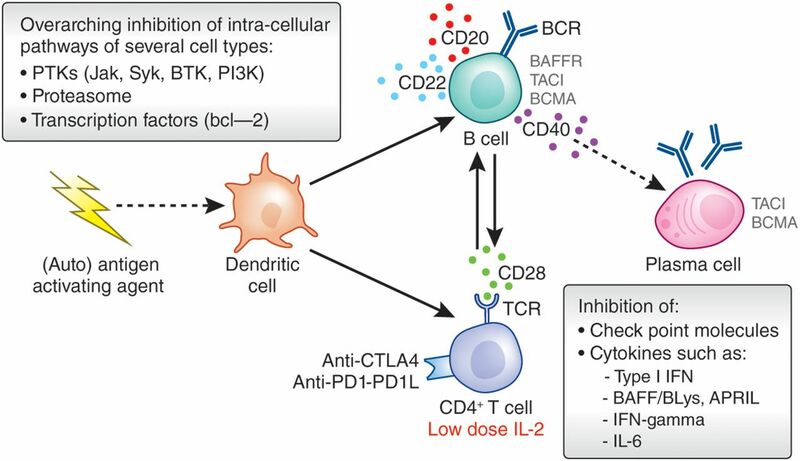 Targeting key nodes of T cell and B cell interaction holds promise to improve abnormal T helper cell activity or enhanced regulatory T cell activity (i.e., using low-dose IL-2) that may also have the potential to normalize B lineage cell abnormalities. Distinct role of B lineage and plasma cell functions in glomerular diseases. The sites of induction and residence, however, remain to be delineated. Anti-CD20 (rituximab) Experience from RCTs leading to approval and several observational studies. Experience from two RCTs and several observational studies. Experience from one RCT and several cohort studies. Proteasome inhibition (bortezomib) Very limited experience. Limited experience from small case series. Limited experience from small cohort studies. RCT, randomized, controlled trial; EULAR, European League Against Rheumatism; ERA-EDTA, European Renal Association/European Dialysis and Transplant Association. Transfer of splenocytes: more severe disease with immune complex deposition in the glomeruli. neutrophils are required. Transfer of antibody alone: mild disease but pauci-immune. Only mild disease without granuloma formation. Depends on the passive transfer of antibodies. No cellular immunity. Disease induction strongly depends on genetic background. Low level neutrophil reconstitution and absence of human T cells due to mixed chimerism. In B cell–deficient mice it was shown that chronic allograft vasculopathy was only observed in the presence of alloantibodies. No cellular immunity. No insights into the mechanism of antibody formation. T cells are depleted by alemtuzumab (anti-CD52) and de novo allospecific B cells and DSA but not alloreactive T cells arise in some animals.